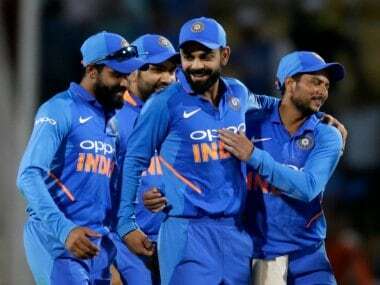 London: Defending champions India hit all the right chords during their resounding 45-run victory against New Zealand via Duckworth-Lewis method in a rain- curtailed warm-up game where skipper Virat Kohli came good after an impressive show from the bowlers. 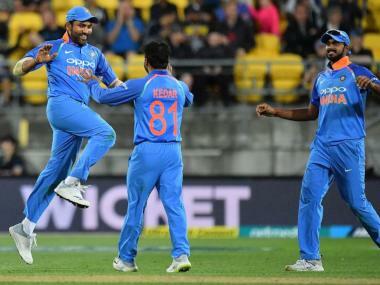 Comeback man Mohammed Shami (3/47 in 8 overs) along with Bhuvneshwar Kumar (3/28 in 6.4 overs) shared bulk of the spoils to dismiss New Zealand for a meagre 189 in 38.4 overs. In reply, India were 129 for 3 in 26 overs, when rain stopped play but they were comfortably ahead of the Black Caps as per Duckworth-Lewis par score of 84 after 26 overs. 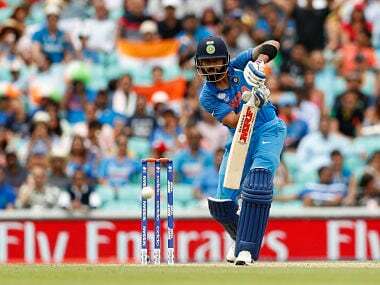 Kohli started his English summer on a bright note hitting an unbeaten 52 off 55 balls while Mahendra Singh Dhoni also played some delightful strokes square off the wicket. Shikhar Dhawan on his comeback got some quality time out there in the middle hitting 40 off 59 balls with the help of five boundaries, mostly square off the wicket. Ajinkya Rahane (7), who is unlikely to find a place in the starting XI against Pakistan on June 4, did not do his case a world of good trying to hook a short-pitched delivery Tim Southee. Dinesh Karthik (0) was given a chance as Kedar Jadhav is a certainty but he was all at sea against the swing. But it was skipper Kohli, who did play a few uppish shots but controlled an easy run-chase adding 68 runs for the second wicket with Dhawan. More importantly, Kohli got a fair amount of game time which will keep in good stead. There was a straight drive off Adam Milne, a couple of cover drives off Tim Southee, an elegant pull-shot. There were a couple of uppish drives which could have gone into the hands of the fielder but Kohli looked positive. Even Dhoni looked good during the brief stint at the crease. The two boundaries and a six were all square cuts. The six could have gone into Colin de Grandhomme's hands but he was a few yards inside the rope and missed the flight. The two boundaries were pure timing which generated a lot of power. It was one such day where everything went in favour of India. 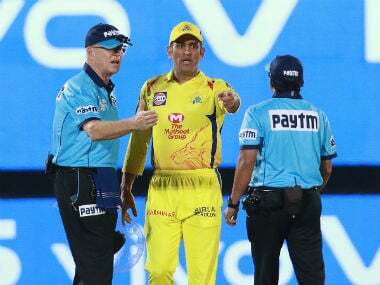 Even though it's practice game but Kohli will gain a lot of confidence from the victory after a string of demoralizing defeats in the recently concluded Indian Premier League. Opting to bat after the coin landed in his favour, Kane Williamson's side struggled to counter India's disciplined bowling effort led by the pace duo of Shami and Bhuvneshwar. New Zealand's innings lasted 38.4 overs. Playing in his first 50-over game for India since the 2015 World Cup semifinal, the 27-year-old Shami quickly got into the act and removed Martin Guptill in the third over, the extra bounce catching the batsman by surprise. A 43-run partnership ensued between Luke Ronchi and Williamson, before Shami had the skipper caught at wide slip by a diving Ajinkya Rahane. Shami struck again when he induced an edge from Neil Broom, reaping the benefits of some tight bowling, as the ball moved away slightly. 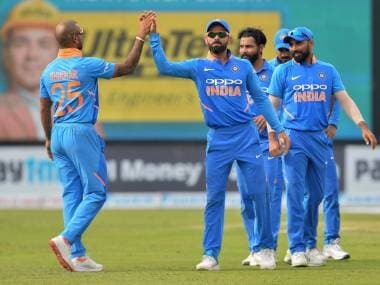 Bhuvneshwar bowled Corey Anderson, while Ravindra Jadeja sent back Ronchi, at a good time from the Indian perspective as the Kiwi looked set for more. Bhuvneshwar wrapped up the Kiwi innings by taking the wickets of Tim Southee and Trent Boult. Ronchi top-scored for New Zealand with a brisk 66 off 63 balls, an innings that was studded with six boundaries and two sixes. However, the rest in the New Zealand top-half failed to get going as they found themselves at the receiving end of the Indian bowlers' swing and seam coupled with the right line and length. Down the order, James Neesham contributed a handy, unbeaten 46 off 47 balls, hitting six boundaries in the process. There were two wickets for Jadeja (2/8) while Umesh Yadav, who was introduce late into the attack, bowled four overs for 11 runs. India are without Yuvraj Singh and Rohit Sharma in this game. While Yuvraj is recovering from a viral fever, Rohit has been granted permission to attend a family wedding by the team management.